15 horsepower, air cooler chiller with space heating option. 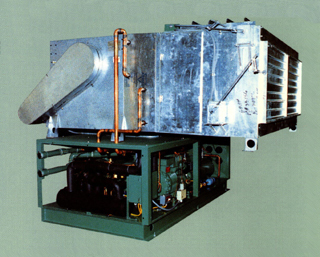 This unit is used for cooling insulating oil used in the manufacture of Transformers. Its duty is to cool 15,000 gallons of oil from 203 degrees F to 77 degrees F in 27 hours or less. The heat which is removed from the oil during this cool down process is used for space heating of the plant in the winter. Plant air is drawn into the mixing box through the return air dampers. (Photo 1) The air passes the condenser coil and is heated to approximately 120 degrees F. The air is then discharged out of the top of the unit by two centrifugal blowers (not visible). This air is then distributed through the shop by a duct system. 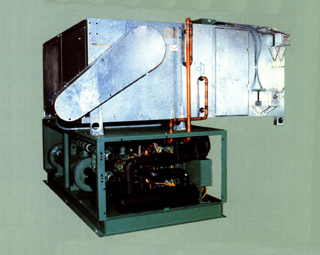 In the summer the condenser air is drawn from outside and returned there by the duct system. Dampers in the supply ducts are used to divert air inside or outside. The quantity of heat available for space heating is 300,000 BTU/H.